5 Bullet Points: The Power of Full Engagement - Attack Your Day! ENERGY: Our most valuable resource is energy not time. Every activity that we do, from breathing to working to exercise require energy. 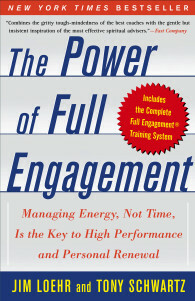 Energy management is key to maintaining full engagement. Energy is simply the capacity to do work. We need personal energy to perform. FOUR DIMENSIONS: Energy comes from four separate but related sources; physical, mental, emotional and spiritual. To perform at our best, we must skillfully manage each of these interconnected dimensions of energy. Subtract one and our talent and skill is diminished. OSCILLATE: The most fundamental need as human beings is to spend and recover energy. This is called oscillation. Just like the ebb and flow of tides, the movement between seasons, the daily rising and setting of the sun, human beings oscillate. We breath in we breath out, we work we play, we eat we digest, we sleep we are awake. Balancing stress and recovery throughout the day is critical to high performance. SPRINTER: Treat life as a series of sprints, not a marathon. To live like a sprinter is to break life down into a series of manageable intervals. We have high concentrated efforts for 90-120 minutes followed by a recovery time. This gives us the ability to maintain energy throughout the day. RITUALS: Rituals much like habits developed over time are key to regaining physical, emotional, and mental energy. Positive habits create energy; negative habits waste energy. A ritual becomes automatic over time like brushing your teeth; you do it largely on autopilot, without much conscious effort or intention.